Cochineal, Dactylopius coccus is a scale insect which has its life cycle on nopal, or Opuntia cactus. It is cultivated on this cactus. The insects have piercing mouth parts, which they use to puncture the cactus paddles thereby allowing them to take in the cactus juice on which they feed. One can visit Cochineal farms, for instance in Oaxaca in Mexico. There one is able to see the live insects in all stages of life living and thriving on the Opuntia cactus plants. The adult and nymphal scale insect is filled with a red pigment, carminic acid, which has been used over time to color lipstick, foods and drinks, and fiber and fabric. Carmine is the color name. We as fiber practitioners are able to purchase the whole dried insect bodies, ground insect bodies, or an intense extract. One of the interesting aspects of this dyestuff is that using distilled water results in much darker and richer colors. Using tap water or well water means that results can be unpredictable (pale colors, often, in my case). I highly recommend doing a series of experiments with a variety of water available to you when dyeing with cochineal, and especially using distilled water. Cochineal in the dyebath is temperature sensitive and also pH sensitive. And as always, keep meticulous notes either on hang tags on your samples or in a notebook. One aspect of cochineal is that it can be used as a substantive dye, thus with no mordant. This is how I tend to use this insect. The resulting color for me is a very saturated, rich and deep magenta. I am quite satisfied with this simple and very slow approach to dyeing with cochineal. A slow and gentle simmer on a very low fire is desirable, because higher temperatures shift the color away from the purple. Typically dyers use cochineal as an adjective dye, in other words with a mordant to aid in the color binding to fiber. I have used this method, as I am sure many of you have. Aluminum sulfate is the common mordant fiber artists use for protein based fibers, such as wool and silk; aluminum acetate is the molecule used for cellulosic fibers such as linen and cotton. I like to let the dyed fiber rest and cool in the dyebath for at least twelve hours after a simmer. Thank you Lisa Bertoldi for this interesting information about Cochineal. I for one am looking forward to dyeing with it at our annual dye party. From time to time I will be letting you know of happenings in our local and New England area. Crochet Refresher – Heather McQueen – Sun. 1 – 3:30 April 3 (1 session) $25 plus materials Not a beginner’s class. 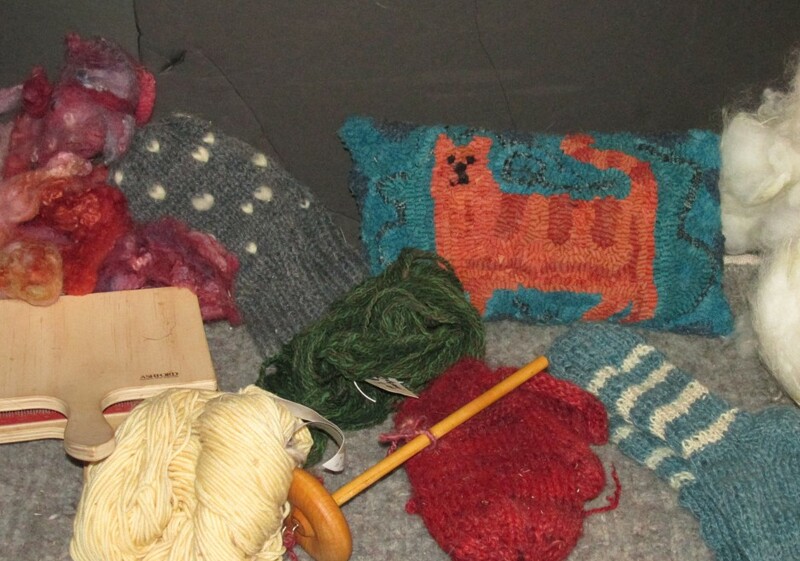 Rughooking with Yarn – Carole Adams – Sun. afternoons 1:00 – 3:00 April 10 & 17 (2 session) $40 plus materials No experience needed. For more information please see the website atwww.sheepandshawl.com/community. Call 413-397-3680 to register. You still have time to make or finish you item for the contest. Lets make the tables overflow with wonderful handmade items. The Wheelhouse Farm Truck from Brookfield Farm in Amherst will be at the fair serving up great food. Those of you from the Amherst area know how good their food is. The fair is held Saturday and SUnday of Memorial Day weekend. COme and join us to celebrate fiber and sheep. Lots of vendors, dog trails, sheep contests, lead line good food and lots to see No Dogs please. The Linen Symposium is full with a waiting list. I am gong to be a volunteer and will report on this highly successful event. This program is put on by the local ATHA group. A unique program to keep informaion on your rugs for the future. in the picturesque village of Shelburne Falls, Massachusetts. rug hooking artists can preserve and document their heirlooms of the future. The Registry is not limited to A.T.H.A. members. It is available to all rug hookers and owners of hooked items. The form below should be used to make your appointment. A Hook-In will be held at the same time & in the same facility as the Rug Registry. bring your own brown bag lunch or order something delicious from a local establishment. Upon receipt of your appointment request, a Rug Registration Form will be emailed to you. Fill out as completely as possible. A trained volunteer will review the form with you at your appointment. The item(s) must be physically present. Digital photos will be taken. The fee per item is $10.00 payable to Region 1 of A.T.H.A. due at the time of registration. I am so glad that I signed up for the class at Sheep and Shawl for “brioche” knitting. I had tried to learn it from both a book and from an internet video, and it seemed to be very complicated. This class proved that it is not above my ability, and is actually a very pleasant way of knitting, once you get into the rhythm. I was, however, glad that she had us put in a lifeline after a few row. I lost concentration at one point, and I was glad that I was able to use it. I had chosen a green heather yarn that I came to love, the more I worked with it. The class was time well spent, a it of time away, and a new skill to lay with. We cast on 24, using a loose cast on. Row 1: *Yarn over, (yarn in front), slip 1, knit 1, Repeat from * across. Row 2: *Yarn over (yarn in front), slip 1, knit 2 together. Repeat from * across. Repeat only row 2 for pattern. Note that with the preparation row you’ll be working on more stitches then you cast on, so plan for that when determining gauge. When ending a project or area of brioche, work the row by eliminating the yarn overs and simply purling 1 and knitting 2 together across, loosely. You will notice that I have put a marker on the right ide of my piece o that if I choose to add another color at some point, I can add it on that side. This make a soft and “squishy” fabric that i warm and cozy. The two color brioche is a bit more complicated, but produces a fabric that is very dramatic in appearance. Sheep and Shaw in South Deerfeld will be offering a course in April so that we can work on the two color version. Brioche stitch was named for a type of a light, sweet yeast bread typically in the form of a fluffy buttery bun. The Stitch was used in 18th Century England to create a soft cushion. This is a dramatic example of a two-color brioche stitch. Read Knitting Books for Enjoyment! Do you ever read cookbooks for enjoyment, not just the recipes? You know the ones, they talk about where food comes from, who invented specialties in recipes, the sense of place that food evokes, and sometimes a travelogue of far-away places. I look for that in knitting books too, and here are several I’m especially fond of – the newer ones I’m still reading, but I’ll point you in their direction anyway. You can find them on the shelves at Sheep & Shawl. In the Footsteps of Sheep, by Debbie Zawinski, is a wonderful specialized tour of Scotland in search of different breeds of sheep and enough of their bits of shed wool (along fence lines, blowing across the grass) to spin yarn and design and knit socks. She found 10 different breeds and includes patterns for 11 different socks. But the sense of place and love for her travels, often by foot and solitary, in all kinds of weather, meeting unusual folks along the way are enchanting. You may never knit socks, but you’ll enjoy reading this book. KNITSONIK Stranded Colourwork Sourcebook, by Felicity Ford, aka Felix, is all about color in the UK as seen through her eyes in finding ways to incorporate the landscapes around her, as well as the daily objects she is drawn to by color and design and pattern, into the mesmerizing patterns of Fair Isle, also known as stranded colorwork, knitting. The beautiful photos may make you want to immediately start swatching in multi-colors. But you can also get happily lost in her enthusiasm for the daily beauty around her. She gives you her step-by-step directions and practical exercises if you want to follow her method, but she really wants to inspire you to find what makes you happy in the colors around you, and that’s definitely worth exploring. Buachaille, by Kate Davies, is about her journey in developing her own yarn line, sourced from Scottish sheep and spun in an historic Yorkshire mill. She reflects on how the landscape influences the qualities of the fleece and named her yarn after one of her favorite West Highland mountains. The book is filled with evocative photos of that landscape, with Kate wearing her knitted creations (she is a designer of many knitting patterns). She is also an expert blogger, an academic and author in a former career. Her attention to detail, her inspired passion about the feel of the yarn, the quality of the light, the local food her husband cooks (here is a book where you get recipes as well as knitting patterns as well as a profound sense of place), are what make so many knitters follow her blog and her latest pattern release. The book is a treasure. Be sure and come to Sheep and Shawl On Sunday, February 14th from 1 to 3 pm to hear Jenny’s talk about Angora Rabbits..
ANGORA RABBITS – THE PERFECT FIBER ANIMAL! I have been raising angora rabbits for about 20 years. I consider myself in no way an expert but I have learned some things over the years and can try to pass them on. I consider angoras the “perfect fiber animal” because they are relatively inexpensive to acquire and keep, take little space, and produce the most luxurious of fibers. And besides that they sure are cute! I would add that they are easy to care for, but that is not always the case; they can be tricky at times. Still, for someone who really likes to get down to the basics and beginnings of things (and I’ll be honest, likes to be in control) but lives in town where the term “livestock” makes people nervous, rabbits are perfect. No room for sheep? No pastures or barns in your future? No problem. There are many ways to house and care for angora rabbits. I will describe what I do. For more ideas and further information, look online, there is a wealth of information there. I keep my rabbits outdoors all year round in wire cages set into wooden shelters. They do fine in the cold (after all, they are wearing full-body angora coats!) as long as they are protected from rain, snow and wind. Summer is a potentially bigger problem, as they can overheat. In the heat they MUST have water at all times and adequate shade and ventilation. If it gets really hot I will sometimes mist the cages or add a large 2 liter soda bottle filled with frozen water. Although tempting, it is not a good idea to bring your rabbit inside to an air conditioned or heated house just to warm up, or cool down for a bit. This sudden temperature change will stress the rabbit more than leaving it outside. The cages are 30 inches wide by 36 inches deep by 24 inches high. That gives plenty of room for them to move around freely and to stand upright. I use 16 gage 1 inch by 2 inch wire for the sides and tops, and 14 gage ½ inch by 1 inch wire for the bottoms. The bottom wire needs to be large enough for bunny poops to fall through, but small enough to adequately support the rabbit. And the higher gage means it lasts longer. Rabbit urine is quite caustic and will eventually wear away the wire. I make these cages myself and it is not hard to do, but truth be told, I also have a wide variety of “hutches” of one sort or another that I have scrounged from here and there. Just be sure the hutch is big enough, has proper flooring and enough shelter. What about food? I feed my rabbits 1/3 cup am and pm with a mix of pellets, oats and sunflower seeds. Evenings they also get a big handful of good quality (but grass, not alfalfa) hay. If you look online, or ask rabbit breeders, you will find any number of feeding regimes. I can’t speak for all of them, but this one has worked well for me. I use 9 parts Blue Seal Hutch Plus 18, 1 part crimped oats and ½ part black oil sunflower seeds. These are all readily available from my local grain store, though I must have them special order the Hutch Plus. I prefer it because it has 18% protein. Angora rabbits, unlike short-haired rabbits, are working hard to grow all that extra hair and need that boost of protein. Once a week (or so) I feed just oats and hay for the evening feeding as a help to prevent wool-block (see below). And fresh, not frozen water for each feeding. I use tHe drip bottles that attach to the outside of the cage. I have heard that rabbits drink more from a dish than a drip bottle, but that is what I have. Be sure to come down to Sheep and Shawl to hear Chris talk about her Pygora Goats. Sunday, Feburary 14th 1-3. Jenny Atkins with Angora Rabbits and Hillary Woodcock talking about Alpaca’s will also be there . Hope to see you all there. What the Heck is a Pygora? I have been asked, “What the heck is a Pygora?” Simply put, a Pygora goat is a versatile small breed of goat that is primarily bred for abundant, lustrous, soft fleece. However, these goats are wonderful animals for the homesteader, as they can also be used for meat and milk. They have wonderful, playful personalities and small stature, which makes them a great choice for 4-H kids. Originally bred in 1980 by crossing a registered Angora dam with a Pygmy buck, these goats are now a true breed. The breed standard allows them to have up to 75% of either Angora or Pygmy. There are three distinct fleece types (A, B, or C). Although there is no preference for any of the types in the breed standard, spinners tend to prefer type B fleece. Type A resembles the Angora coat, with long, lustrous curls. Type C fleece is short and fine, cashmere-grade, with a slight crimp. Type B, which is what my goats are, is in between A and C. Type B fleece is between 3” and 6” long, lustrous, fine, and crimped with a curl at the tip. One advantage of Pygora fleece over Angora fleece is that Pygoras’ fleece maintains its fineness even as the goat ages, whereas Angora goats’ fleeces become coarser with age. Another advantage is that Pygoras come in different colors, like their Pygmy goat ancestors. Unlike sheep’s wool, goat fleece does not contain lanolin, which gives unwashed wool its greasy feel. It does, however, contain a certain amount of “guard hair” which must be removed to increase the comfort factor of the finished product. The softness and fineness of the fleece make it the perfect choice for knitted baby clothing and accessories worn next to the skin. It can be spun into laceweight yarn or blended with other wools. At Dunroamin Farm, we typically shear our four goats once a year in the spring, although some years we have gotten two shearing’s (spring and fall). Unlike a professional sheep shearer, we use scissors, and put each goat on a pygmy-sized milking stand to do the job. It generally takes us most of the afternoon to clip the four goats. They look pretty silly after shearing is done (because it’s hard to give a nice haircut when the subject is ticklish and jumpy). Because they look different to one another, they usually end up butting to re-establish the flock hierarchy. Rather than send the fleece out to a mill to be processed, which can result in the loss of 50% of the fleece, I hand process the fleece at home. It is very time consuming to skirt, wash, and remove the guard hair by hand, but I think it results in a wonderful product with less waste (I don’t throw away what I remove – I use it as mulch in my garden). My cleaned and combed fleece is available for sale at Sheep and Shawl in Deerfield, MA, ready for your spinning or craft project. If you have questions about the goats or the process, please feel free to contact Chris at (413) 367-3052 or cspellerin@comcast.net. 1. Wool is warm and toasty to wear Fall through Spring. In fact, it can keep you cool in Summer as well (surprising, I know, but read about the thermal properties of wool). 2. Wool connects me to sheep, an animal that has provided fiber for clothing for thousands of years worldwide. 3. Wool is nearly waterproof, is still warm when wet, and can be made waterproof by felting. It reminds me that some ancient and modern people have used large mats of wool felt to create nomadic housing (yurts). 4. Wool is a renewable resource – fleeces must be shorn from sheep every year to keep them healthy, and we benefit from the yarn spun from the fleece. 5. Wool yarn comes in a variety of sizes, from lace weight to bulky, so there is never a shortage of accessories I can knit. 6. Knitting with wool is good for the hands. Some wool yarns are minimally processed and still contain lanolin (the sheep’s natural “oil” in the fleece), providing a nice waxy smell, and smoothing the hands that are gently exercised by knitting. 7. Knitting with wool connects me to my ancestors who also knit with wool. Browsing through vintage knitting magazines and reading articles about historic and traditional knitting patterns offers me more connection. 8. Buying wool yarn from local farmers in my area helps to protect the local economy, buying as close to the source as I can (as I am not a shepherdess). Sometimes I even know the name of the sheep whose wool I use. 9. Buying wool yarn that is locally and regionally produced in other parts of the country and the world helps to protect those local economies and to create and maintain community supported agricultural efforts.